I think we all have tasks that we find difficult to concentrate on and begin to daydream. Here are a few suggestions to try, let me know if any resonate with you. Set a timer – agree to work until the timer goes off and then change tasks or take a break. Do this until the task is completed. Getting up and moving can really help to let you be able to go back to the task and concentrate again. Give yourself a reward, when it is done I can ……. I hope you find that these suggestions can help you to focus and get it done quicker. If it takes less time because you are focused you will need to focus for less time. 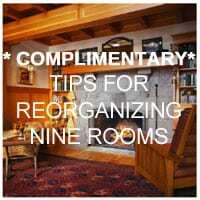 Need more information about working with a Professional Organizer?